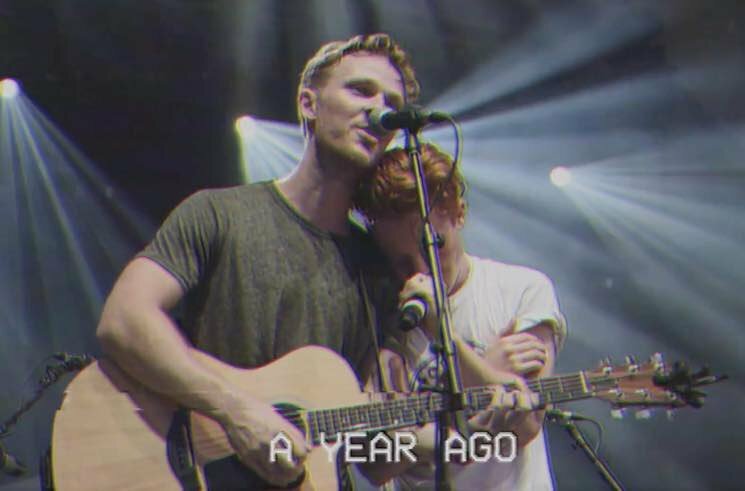 Birds of Bellwoods recently released Victoria, and now they've treated "A Year Ago" from that album to a music video. The clip compiles footage of the band from their recent travels on tour, including festival stops at Osheaga, Festival d'Été, Hillside and Mariposa. It was shot and edited by the group's tour photographer/videographer Morgan Hotston. "'A Year Ago' started in a conversation I was having with a buddy of mine who lives out in BC," frontman Stevie Joffe tells Exclaim! "There's a beautiful festival in Jasper we've been lucky enough to play twice, and the first year this friend came and met up with us to party and yell at mountains and that kind of thing. When we were invited back I got in touch right away to bring him in on round two. It had been about six months since we'd chatted. He told me he wouldn't be able to make it this year, as he was now married and expecting his first kid. I remember him saying 'that's all it takes.' Brought a few lines like that in, we jammed it until it was about thirteen minutes long and then cut it down from there." Joffe added, "Apparently the kid loves it. But he's a baby, so I'm sure he doesn't grasp the inherent existential dread." Despite the underlying nostalgia, the song is an upbeat jam that was surely a massive sing-along at the aforementioned festival sets. See the band's upcoming tour dates below, then hit play to relive Birds of Bellwoods' memories from shows gone by.